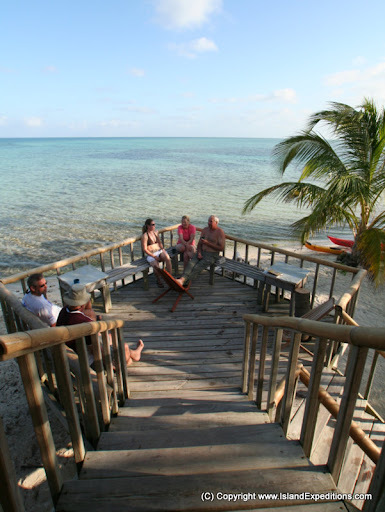 My Island Expeditions Belize Vacation - I was a Belize virgin heading for Paradise Islands. Yes, this is a love story. Girl Meets Belize…and twelve new friends The first magical moment came after darkness fell on the first day of our adventure. We’d long since left Belize City and electricity behind us. Eventually even Anastasio, our guide, fell silent as he drove us newcomers down the two-lane highway. If Belize is such a small country, I thought, why does this wilderness stretch on forever? Anastasio turned off the road and the van’s headlights lit up a sign for the Tropical Education Centre. Tired, hungry, and more than a little curious, we spilled out of the van. In the middle of this marshy nowhere was a neighbourhood of immaculate tiki huts on stilts. A web of pathways dotted with solar lamps led us to a spectacular dinner (honestly, I’ve never tasted beans that good) and then to bed.